In his state of the union address on Tuesday, U.S. President Barack Obama spoke of diplomatic pressure that has forced Syria to surrender its stockpile of chemical weapons. Now imagine a world where dictatorship, terror and fear – and 95% of those chemical weapons – remain in place. As cargo ships wait to transport these weapons to their eventual destruction, the Assad regime is dragging its feet and failing to deliver. It is now eight weeks behind schedule. It blames the civil war it continues to wage for making it more difficult – a new definition of ‘chutzpah’ for the Oxford English Dictionary, perhaps. And all the while, even as both sides sit around the peace table in Geneva, the Syrian government conducts a scorched-earth policy against its own people. 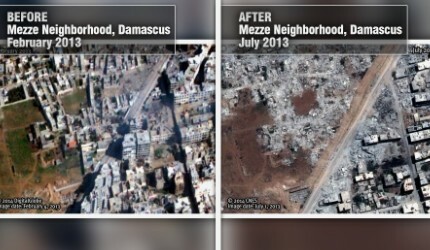 These satellite images, just released as part of a new human rights watch report, show a neighborhood in Damascus – before and after its demolition last summer. Buildings have become graveyards and graveyards shelters for thousands of civilians left homeless and besieged – literally starved for food, water and electricity – not only in Damascus, but in once thriving cities like Aleppo and Homs. No, it's not the Middle Ages. It's modern Syria – where diplomats keep talking and people keep dying for a crust of bread. When we laid it out we have to go back to the UN, on the WMD, statements, resolutions, sanctions. Then we go back to the Presidents position on bombing Syria either under a UN resolution or unilateral. Time what's time, they want to break the stalemate, dump more fighters and weapons in. Time is nothing other than suffrage for the civilians. Just like Iraq it is all the same, Russia gives the US a statement or bombing, sanctions or bombing a resolution or bombing. Bashar al-Assad will restore democracy to Syria. He just has to cull the herd of potential anti-Assad voters first. Besides, he's so committed to peace, he'll give up his chemical weapons! He'll just have to keep on using cluster bombs and artillery to kill all those non-Alawites instead! Rupert, I think Singh was being sarcastic. You really don't agree do you? 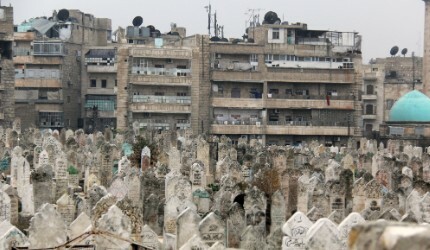 dis senseless killing of innocent civilian shd stop, does al-assad want to preside over dead syrian. dis madness shd stop. This is yet another CNN pro war propaganda piece. Some people are just itching to get the west (particularly America) involved in this sectarian mess. To my fellow American citizens: This does not affect us. This does not involve us. We have no dog in this fight. This is not our responsibility...and never forget the Syrians burn our flag and despise us. Let them all pound sand. Countries like Syria NEED a dictator at the helm. They are not nation states, and are populated by various groups that only want to murder each other. Look at Iraq without Saddam, and Libya without Kadhafi. They are places of anarchy and religious extremism. At least dictators keep the power of religion in check. Its the greedy america that is creating all the terrorism , lawlessness, bloodletting & violence. Its the American/western supported groups who are doing all this. Stop western influence now.